Mamas! This one is for you! As a Mom -and a “fitness Mom”- I totally understand the pressure to ‘lose the baby weight,’ ‘get your body back,’ or ‘fit back into your skinny jeans.’ It’s not necessarily pressure from anybody else (sometimes it is) but more often from ourselves. And it makes sense- I mean when you have a baby your world turns upside down- especially when it is your first! You are likely sleep deprived, you’re trying to adjust to the demands of feeding and getting on a schedule- just so you can regain some sanity! Maybe you are breastfeeding, maybe you aren’t- either way your hormones are doing all sorts of wonky things (getting back on a natural woman-ly schedule, losing hair, digesting all of that extra fluid- including your increased edema and blood volume from pregnancy and more!) The point here being that it takes TIME for your hormone levels to adjust to no longer being pregnant. 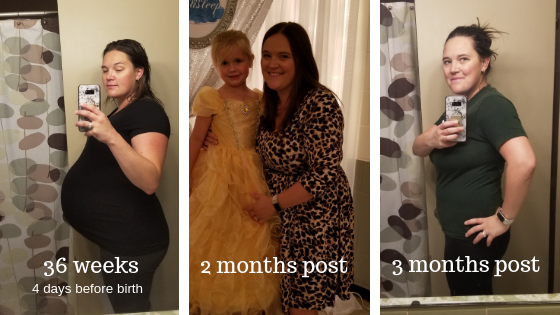 So, I get it- you want to do something to feel like yourself again - and getting back into your pre-pregnancy clothes feels like one of the best ways to do that. I want to tell you to STOP this thought process- give yourself some grace! Cut yourself some slack. STOP being so hard on yourself. You LITERALLY just created a new human being- that’s right, you did that, Mama! Move your body in a way that works for your schedule and feels good for YOU! My point is- move in a way you enjoy and be happy with what you are doing… not critical of yourself that it’s not enough or that you should be doing more. Yep, that’s how much h2o you should drink… Seriously, aim for minimum half your body weight (lbs) in ounces. Eg. A 140 lb person needs to drink a minimum of 70 oz of water per day. If you are breastfeeding and at least another 8 - 16 oz to that… or better yet, drink 8+ oz every time your feed your baby. Eat healthy foods and absolutely do NOT restrict calories. I repeat Do. Not. Restrict. Calories! Your body requires energy. If you do not provide it your milk supply, energy levels and overall mental states will suffer. Try to consume fruit and natural sweeteners (honey, maple syrup, applesauce) instead of processed sugars. You can often find recipes that use one of these 3 in muffins, cookies, etc.. If you are hungry- EAT and then drink a glass of water. I am breastfeeding twins and I figured out that my daily caloric expenditure, without any exercise, is just over 2500 calories per day. If I’m below that I feel it- my milk supply drops, I have no patience and NO energy! STOP listening to/reading/obsessing about the ads, stories, programs that you see on social media. You know the ones that talk about how they got their flat belly back in just 4 weeks. First and foremost, our bodies all respond differently to pregnancy and sometimes the same body responds differently to each pregnancy. For example, with my first I gained 51 lbs; with my twins I gained 60 lbs. I left the hospital 20 lbs lighter with both but it took 4 months to lose another 15 lbs with my first and only 2.5 with my twins. With my first I held onto an ‘extra’ 10 lbs until 3 weeks after I finished breastfeeding and it quite literally dropped off me… time will tell with this new journey. We are all DIFFERENT! Make friends with another amazing Mama. Share your frustrations with her and let her tell you how amazing you are doing, because you are. It’s easy to get caught up so another person reminding us of how amazing we are and what we should be focusing on is a blessing. It’s what prompted me to write this blog… and remind myself of the above points, because I can get caught up just like you. So, please remember, your job right now, mama, is to LOVE on your baby(ies) and give yourself time to heal, rest and bond with your new tiny human(s). Much love to you- this journey isn’t easy but it’s pretty damn amazing!